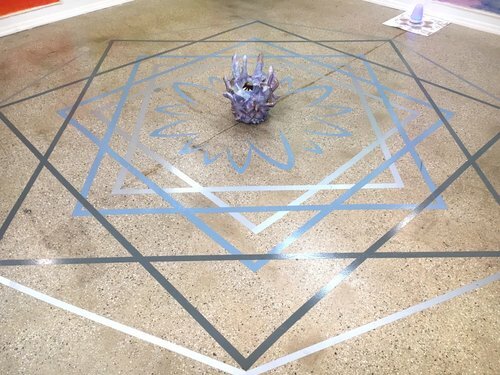 Mystic Geometry - Circling the Square is an immersive and site-specific installation that centers itself around an octagonal floor mandala and sculpture situated at the center of the square gallery. The walls of the gallery are composed of seven largescale paintings that feature geometric forms creating a panoramic sanctuary for the viewer. 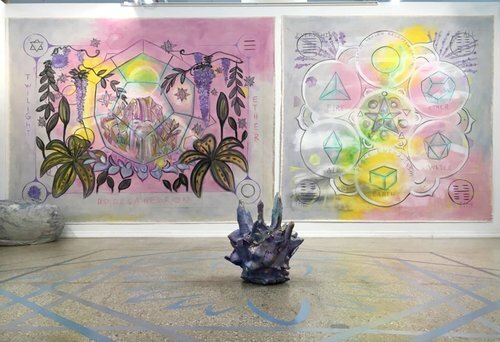 The geometric forms found in Lanfranco’s artwork represent the elements of nature and mystical concepts. This exhibition provides a reprieve from everyday life and offers an inviting and encompassing aesthetic experience. Through her installation, Lanfranco investigates the symbolic characteristics and allegorical narratives of Platonic solids and geometric forms that exist in nature. 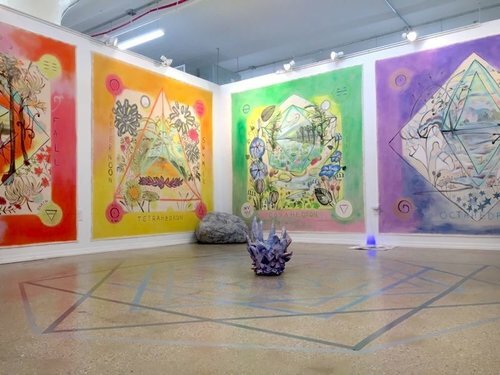 Lanfranco explores the physical and esoteric mysteries of such naturally occurring forms that have been referenced throughout art history, spirituality, and philosophy. Coinciding with the exhibition, Trestle Gallery is pleased to host: “Curator as Artist: Katerina Lanfranco” a gallery talk on Tuesday, May 23rd at 7pm. In the spirit of Trestle Gallery’s 2017 exhibition theme “Artist as Curator,” Chief Curator, Katerina Lanfranco reverses her roll from curator to artist. Lanfranco reveals her studio practice through an open dialogue during the fabrication and installation of her site-specific work with guest curator Katherine Murdock. Katerina Lanfranco makes paintings, drawings, sculptures, and mixed media installations. Through her studio practice, she studies the intersection between nature, science, and fantasy. Lanfranco earned her BA from UC Santa Cruz and MFA from Hunter College, CUNY. Her artwork is represented by the Nancy Hoffman Gallery, and is in the permanent collections of the MoMA, the Kupferstichkabinett in Berlin, and the Corning Museum of Glass. Lanfranco is the founder of Rhombus Space. Katherine Murdock is the Assistant Curator at the Visual Arts Center of New Jersey which is one of the largest public institutions in NJ devoted exclusively to Contemporary Art. Since 2010 she has managed over thirty curated group and solo exhibitions and organized over 60 community art exhibitions for the Art Center.